Home / Booboo-Stewart / Edi-Gathegi / Fan-Bingbing / Halle-Berry / Lists / Movies / Nichelle-Nichols / Nichols-Test / Olivia-Munn / Omar-Sy / X2 / xmen / XMen-Days-Future-Past / Xmen-First-Class / Xmen-Last-Stand / Zoe-Kravitz / Which is the Most Racist X-Men Movie of All TIme? 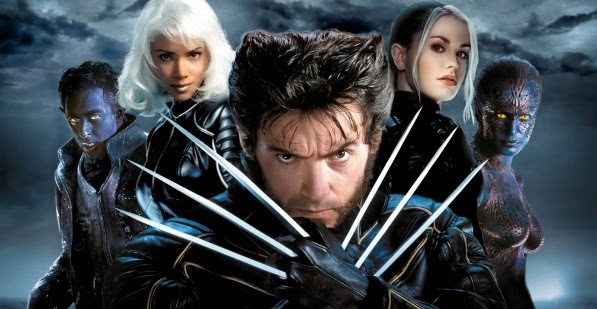 Which is the most racially diverse movie in the X-Men franchise? We love the X-Men films. The movies have had themes of diversity and equality from the beginning and have set new standards for superhero films. Sure we love Hugh Jackman, but how diverse are the movies? Have they set new standards for racial equality as well? On Monday, it was announced that Psylocke will be played by Olivia Munn in X-Men: Apocalypse. The exciting thing is Munn is she's Chinese on her mother's side, meaning the fan-favorite character will be played by an Asian and not "white-washed." In the comics, Psylocke's a British woman named Elizabeth Braddock who took on a Japanese woman's body. While Psylocke has mental abilities like mind-reading and telekinesis, her most recognizable feature is her ability to generate glowing blades using her mind. So far, the cast of Apocalypse is pretty diverse: Alexandria Shipp as Storm, Fan BingBing as Blink, Lana Candor as Jubilee and Olivia Munn as Psylocke. It started us thinking about the diversity in the upcoming film and past films. My brother and I have been talking a lot about what we call the "Nichols Test" (named after the pioneering Black woman in Star Trek: Nichelle Nichols). It's a way to rate how racially diverse a movie is. It's a lot like the Bechdel test, but it talks about ethnicities. One of the most important parts of the Nichols test is asking how important are the minority characters? Is it just "window dressing" or do they contribute to the film? How many minorities are in the film (must be a speaking role)? Do they talk to each other (on screen)? Are they socially or economically superior to the highest billed white character? So, using that criteria, here's how we rank the X-Men movies. The answer may surprise you. No matter who you think the main character is - Wolverine or Rogue - the minorities are superior. Storm is a leader and a teacher which makes her socially superior to the teenager and the vagabond. On the other hand, there are no other minorities, so she doesn't talk to anyone other than the Caucasians. For all Bryan Singer's claims about diversity and the importance of recognizing minorities you'd think there'd be a couple more Black people. By this point, all the main characters are teachers including Logan, so none of the minorities in the movie are superior to any of the others. You might be asking about Kelly Hu as Lady Deathstrike, but she doesn't say anything and certainly doesn't talk to anyone. This movie ranks the worst of all of them. It's a huge step backwards for the franchise. 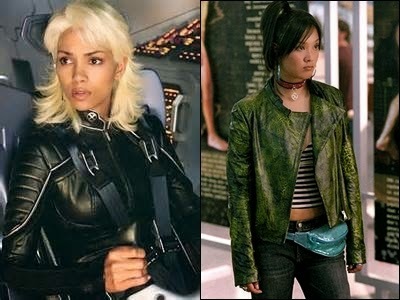 With all the flaws in Brett Ratner's X-Men movie it stands out as a very ethnically diverse movie with a total of seven speaking minorities (and one non-speaking one: Omahyra Mota as Arclight). Bill Duke plays a (race-changed) U.S. Secretary which outranks every other white character in the film. 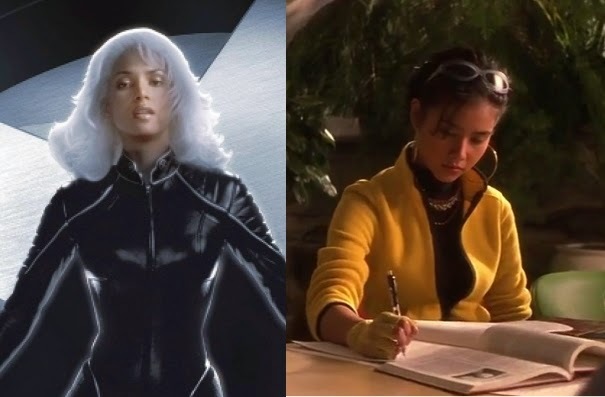 Also, Halle Berry becomes the leader of the X-Men and shines. Unfortunately, the movie loses points since we never see the characters talk to each other. Three great minority characters are major stars in the film and that's awesome. Unfortunately, they never talk to each other on screen. Agent Zero has a very prestigious role and plays a huge part in the film. While will.i.am does a good job, along with Silverfox, neither really take on a position of prominence. Also, some have said Lynn Collins Cherokee heritage is doubtful. It's hard to tell though. With that "good hair", she mus' have Indian in her family. There's a nice mix of ethnicities in this film including two Hispanics and an African-American and two talk to each other. But, the main characters - Professor Charles Xavier (James McAvoy) and Magneto (Michael Fassbender) - are economically and socially superior to all of them. 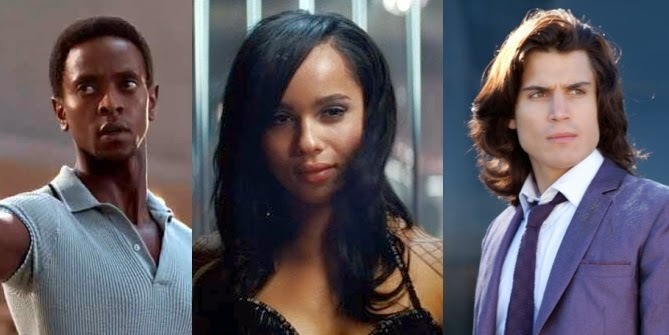 Kravitz even plays an exotic dancer who is "saved" from her lifestyle by the White people. Disappointing. This movie gets a high score of 10. The movie has multiple prominent Asian characters (which isn't surprising since it's set in Japan) and they talk to each other a lot. The only nitpick we'd have is there are no other ethnicities. No Latinos or Black people. Still, it's a big step forward from the first film. There are only five minorities in this film and they're all in the future battle scenes. They have very few lines and all die. The dying part isn't a big deal, but it's ridiculous that they have so little to do. Bishop and Blink barely say a full sentence and none of them have an actual conversation. While Halle Berry was pregnant during filming and couldn't do many action scenes it doesn't mean she shouldn't have had a conversation. But, at least more than two minorities are in the film unlike the first one. Plus, Bishop is so cool even when he says nothing, he says everything. So, what does all this mean? It means that The Wolverine stands as the most ethnically diverse mutant movie of all time. X2 is the most racist. We'll see where the new movie stands, but at least the trend is going up. What do you think of the minority roles in the X-Men films? Which is your favorite X-Men movie? Will the next film be more diverse? Really interesting. I hadn't thought about it in terms of ranking the films. When you consider all the comics, it's pretty surprising how much some of them have fallen short. I think it does speak well that Marvel has started to hear people in terms of wanting to see more diversity in the cinematic world. And I'd say that's definitely have a correlating impact on other studios. That makes sense that The Wolverine would have the most minority characters. Though besides Asians I don't think they had many other minorities represented. Set in Japan, it would've been odd not to have a lot of minority characters. Shame the movie wasn't very good though. I like seeing diverse casts in all movies. I'm surprised the media are still so 'behind'. A lot of successful movies copied Star Trek's trend setting ideas. They just did it better by reinventing characters with emotionally deep backstories enhanced with cgi and all the glitz hollywood has to offer. You guys certainly think out of the box. I'm more of a DC person, but thankfully the X-Men films have gotten more color over the years. I hope y'all are doing well! When the most successful franchise makes a move all the other studios follow suit. The comics are rich with mutants of all ethnicities Tim and I'm looking forward to the future films exploring that. It always makes for a richer moviegoing experience. 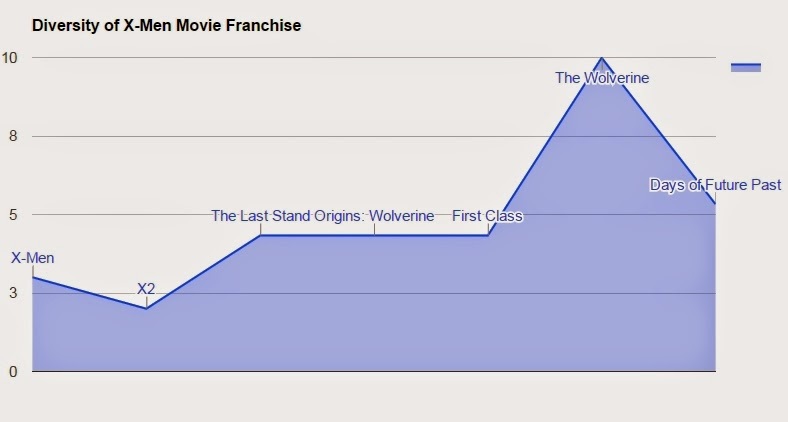 The Wolverine should not be on this list since it takes place 99% in Japan, making Wolverine the "minority". It's called bad writing and a misuse of resources. The story takes place outside of the US so the term minority is misused here. I think this one, due to geolocation should be excused from the list. That's a good point! But it's more a reflection of how the races are portrayed regardless of location. Worth noting though. I understand the point of race portrayal, but there is still the issue of context and setting/environment. Japanese people are a minority in America, BUT when the story is set in Japan, the rule changes. It also doesn't help that the film sucked, sorry I couldn't help it. I gotta agree with with you there Vernon. A good writer would know how to showcase all the characters equally well. Thanks for stopping by!